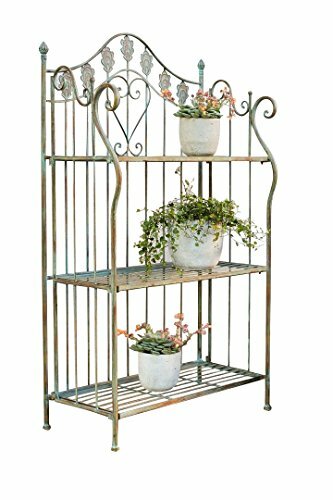 This wonderful shelf in romantic antique look with original peacock detail is a jewel for garden, terrace or balcony. Made of green patinated metal with trendy grating effects, it provides 3-tier shelves for ample storage area or display. This stylish baker's rack will bring utility and charm into your decor for years to come. The rack can also be folded allowing for easy transport or storage when not in use. Use: Outdoor, Garden decor; Material: Metal; Includes: One folding metal shelve; Others: Decorative items not included. If you have any questions about this product by PierSurplus, contact us by completing and submitting the form below. If you are looking for a specif part number, please include it with your message.